Like almost all churches, UUCC depends on the generosity of its members and friends to carry out its mission, pay its staff and maintain its facilities. In the late winter each year, we conduct a stewardship drive to receive pledges for the fiscal year beginning July 1. We also encourage newcomers to pledge when they begin participating in church activities or become members. Pledges are crucial to our budget planning process. Unpledged donations are also very welcome – make an online donation. Overview • How to Pledge • Questions and Answers • Videos – Why is UUCC important to you? According to our church bylaws, church members are expected to contribute financially to the church. We understand that personal circumstances may not allow everyone to make a substantial pledge, but we encourage some financial contribution of record from every member every year. Determine your monthly income or resource level. Add an unusual or periodic income you expect. Subtract any extraordinary expenses you expect. From the Adjusted Monthly Income column, move to the right to find a giving level you are ready to support. Placing it in the collection basket at a worship service. 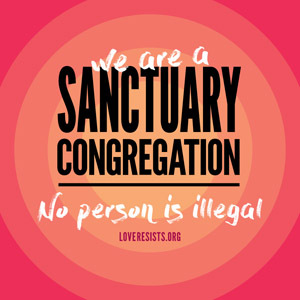 Mailing it to the attention of the church administrator, Unitarian Universalist Church, 2615 Shepard Blvd., Columbia, MO 65201. Scanning it and emailing it to the church administrator. We ask that those submitting pledges consider giving via monthly automatic funds transfer if you are able, as this provides consistent income for the church. You can obtain information on automatic funds transfer by calling the church office at 573-442-5764 or by checking the appropriate box below in the online pledge form. If you are ready to set up automatic payments, you will need to complete the ACH Recurring Funds Transfer Authorization Form (PDF). You will be sent automatically to Paypal to make a secure payment on your pledge. When you complete the payment, Paypal will give you the option to be returned to the home page on our website. When we have been notified by Paypal that your payment has been received, you will receive a confirming email which will serve as a receipt for your payment. Note: Paypal’s service costs the church 2.2% + 30⊄ per transaction. You will receive full credit for your payment, but if you are able, please consider a slight increase in your payment to help the church pay the transaction cost. The following online pledge form is intended for those making a pledge at times other than during our annual stewardship campaign. Note: Your online pledge submission will not be complete until you check the “Submit” button below the online pledge form. Note: Your pledge submission will not be complete until you click the Submit button. When you click Submit, you will receive a confirming email, your pledge information will be emailed to our Church Administrator and Stewardship Team Chair, and you will be sent to our website home page. 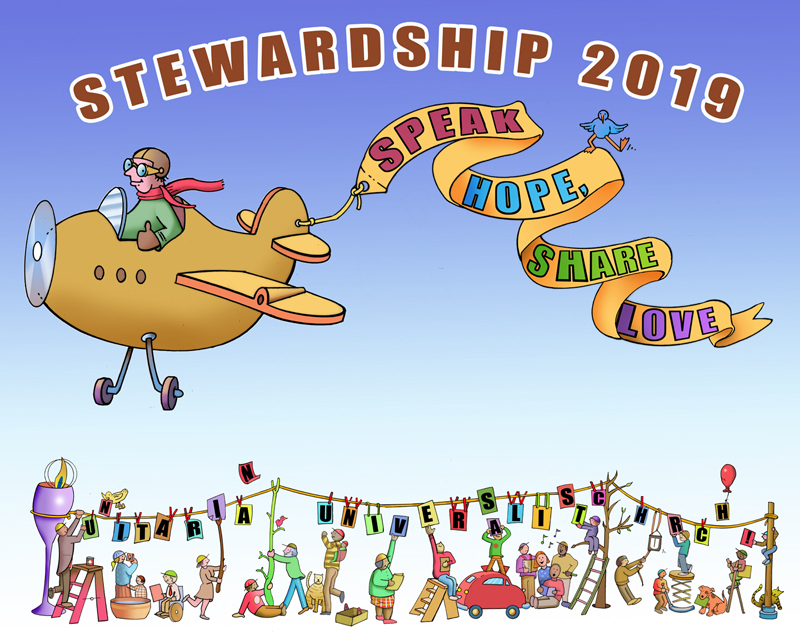 What is the annual stewardship campaign? The Unitarian Universalist Church of Columbia is financially autonomous. We have no diocese or umbrella organization to support us if we fail to meet our annual operating budget needs. We are it – we are in effect a co-op. The annual stewardship campaign provides about 90% of the revenue we need, with the rest provided by pledges made at other times of year, church facility rentals, undesignated Sunday offerings, etc. The annual stewardship campaign is held in late winter-early spring of every year, but pledges can be and are made throughout the year by new members and friends as they realize the value they find here. During the stewardship campaign, every household in our community is asked to make a pledge – a promise – of financial support. The pledge you make and then honor in the upcoming year keeps the Unitarian Universalist Church of Columbia thriving. What are five easy ways to pledge? Mail your pledge card to the attention of the church administrator, Unitarian Universalist Church, 2615 Shepard Blvd., Columbia, MO 65201. Members. Friends. Parents. Newcomers. 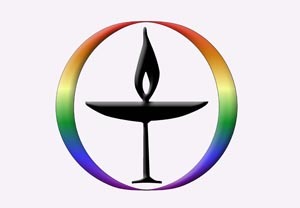 Each of us who is connected to the Unitarian Universalist Church of Columbia is asked and expected to make an annual financial commitment to support the church. I am not ready to become a member of this church, so why am I getting information about pledging? We have many non-members of the church who pledge financial support. We call them “friends” of the church. We invite everyone who is regularly participating in church activities to make a pledge. This is a personal decision. We ask that you consider your personal budget, and determine an amount you can contribute to the church on a weekly or monthly basis. We believe that our standard of giving should reflect our standard of living. We ask everyone to consider making a pledge that is both responsible and significant based on his or her own financial situation. A commitment appropriate to our faith tradition is 2% to 5% of net household income. For more guidance, see the UUA giving guidelines above. Most of our members are able to contribute on a regular basis, and many households already pledge at these levels. For those who do not, we ask you to consider working towards this goal over time. For newer members and friends, we ask that you consider pledging an amount that reflects a serious commitment to the place you have chosen as your spiritual home – not simply to make a donation to yet another charity. I’m doing well – what should I pledge? If you attend Sunday services, are active in our programs and activities, or if you have children in R.E., OWL, or Youth Group, and these connections are important in your life, then please consider more than 2% and demonstrate your commitment with a significant pledge. I have a limited income, what should I pledge? Please know that you are always welcome at our church. If you’re out of work, have a modest income, or are facing demands on your resources, then pledge what you can. What if I have a hardship situation that prevents me from making a financial pledge? If you cannot make a financial pledge due to hardship, and wish to remain an active member in the UU Church of Columbia, please discuss your situation with the minister. How is pledging different from giving money to the offering? While donations via the weekly offering are greatly appreciated, and are used to help support the church and its causes, they are unpredictable, and thus we cannot rely upon them in planning our budget. Also, twice a month, undesignated cash offerings go toward our Faith-to-Action collections. Other the other hand, pledges give us a good idea of the funds we can expect during the year to support our operating budget. Pledge payments may be placed in the offering plate, but we ask that they be made by check with a notation on the memo line that they are for your pledge. If you want to place cash in the offering basket toward your pledge, you can place it in an envelope with your name on it â€“ otherwise, we have no way to track cash contributions. What about the time I contribute? Do you just care about money? Your volunteer efforts are greatly appreciated! You understand the value of our staff, our building, and the things that we do for each other and for the rest of the world. These require money as well as time. Most members of our church volunteer their time, too, as well as pledge. We could not survive without the generous donations of our members’ and friends’ time and talents. If you are eager to know more about our volunteer opportunities, committees, and other areas where energies are needed, please read our weekly announcements or talk to Rev. Molly Housh Gordon, board members, or various team or committee leaders about the options open to you. The stewardship campaign is the only time of the year we talk more about money than other things, because we need to make sure our financial house is in order so we can do more with and for our members and the community. If you are a member of the church, almost $100 of your pledge goes to pay national and district dues for the Unitarian Universalist Association. The rest of the pledge is used to pay salaries and benefits to our staff, building maintenance costs, administrative costs, and programming and committee costs. Our budget details the amounts budgeted for sub-items in each of these areas, and we provide regular reports of our expenses. Can I designate what I want my money to go to? Not specifically. 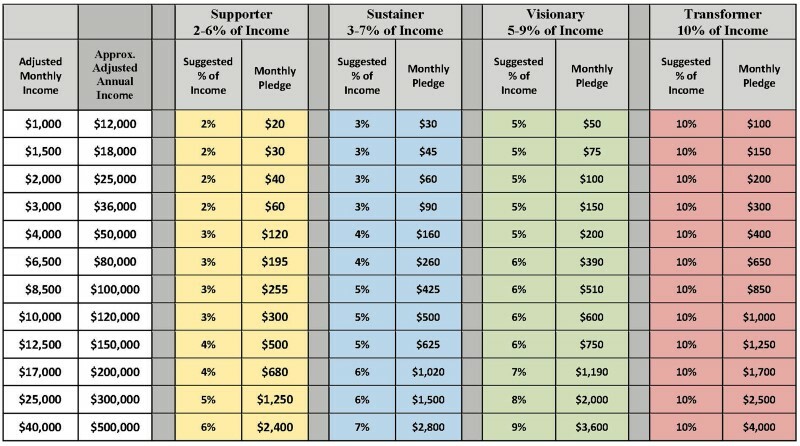 If you are a member of the church, you have a voice – when considering the budget – in deciding how the overall church pledge income will be used. However, it is not possible to earmark specific pledges to pay for specific things. How do I change my current pledge? If your financial circumstances change and you want or need to change your pledge – either up or down – simply contact Church Administrator Suzanne Clark in the church office (573-442-5764 or email) and tell her what you would like to do. A pledge is a promise – it is not a contract – but letting us know of your intention if you need to change your pledge helps us anticipate our cash-flow and manage our budget.